We have all been there. At the grocery store… at the club… at the train station, a man tries to talk with you and won’t take no for answer. You try to ignore them. You try to let them down easy. You finally tell them “Look I’m a lesbian, it’s not happening”. At best they roll their eyes and walk away, at worst they spout some deragatory comments and eventually still walk away. 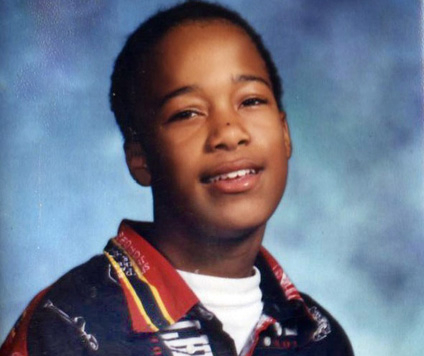 On the night of May 11, 2003, Sakia Gunn, a 15 year old high school basketball star, was attacked and murdered by a group of men who refused to walk away. 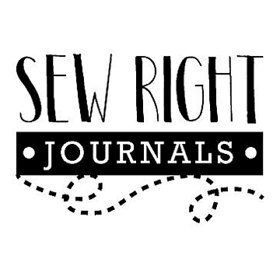 After a night out in Greenwich Village, Sakia and her friends were waiting for the #1 bus when they were approached and propositioned by two men. After telling the men that they were lesbians and were not interested in their advances, the guys viciously attacked them. While trying to help her friend that was being choked, Sakia was stabbed and eventually died as a result of the wounds at University Hospital in Newark, NJ. Robert McCullough, her murderer, turned himself in and eventually was sentenced to 20 years for aggravated manslaughter, aggravated assault, and bias intimidation. (Why this wasn’t considered a federal hate crime, I have no clue. I will let my legalese lezzies answer that…). 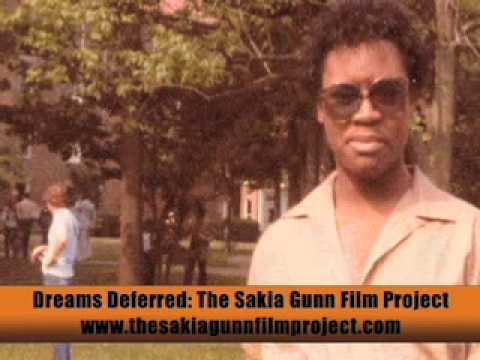 Sakia’s murder was senseless and cruel but it wasn’t in vain. Sakia’s murder shocked and stirred the LGBT community of Newak to its core. Out of the wake of this tragedy, groups like the Newark Pride Alliance were born. Her story has been told in film and on stage. 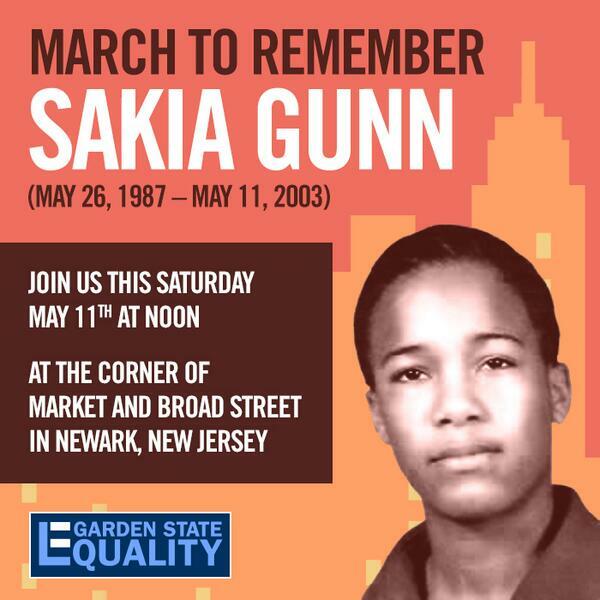 Today on the 10th anniversary of her murder, the Garden State Equality group held the “MAY 11, 2013 MARCH TO REMEMBER SAKIA GUNN” to commemorate her legacy. 10 years ago, we lost a daughter, a friend, a student, and one of sisters, and we will not forget!